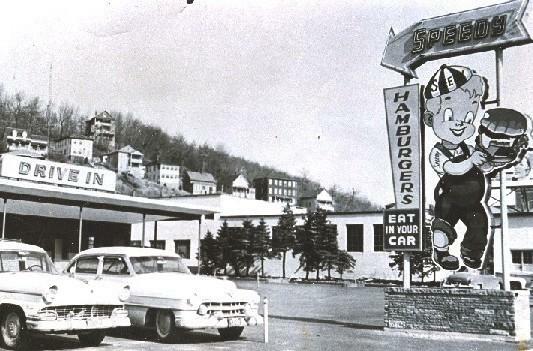 Speedy hamburgers the place to go 1950's and 1960's. Cars, Girls, Guys & food (most were fast). Many came from miles around to run for pink slips (car titles/ownership) setting up a race at Speedy for a run a mile or so away. The following are links about Speedy's Hamburgers you may find interesting. Also check out the other pages. The following are comments left about Speedy's Hamburgers from site visitors such as yourself. They are not spell checked or reviewed for accuracy. Pontiac also a fast car circa 1960, But Chevi "King" was fastest on streets near Speedy's in Worcester. Don't get me wrong there were plenty of Ford and other cars that were, fast but "THE big Dog A 409's Chevy ruled Speedy Hamburger in the late 50's". Many a vet loosing to a BIG 409. Where was this? Shrewsbury or Grafton St.? Hay Joe Reidy, Speedy's location is GPS 42.2671 -71.7837 or near 224 Shrewsbury Street. Place burned down in circa 1970. Now its a parking lot, gps and a google earth show the outline of "Speedy's building" on a parking lot. Wow the good old days.Cruising Shewsbury St,Pulling into Speedy's across from Lawless Cadillac,Pontiac. Burgers & Fries.Burning rubber as you left.Wish we could bring it all back. I have a lot of family from Worcester. Butchie Rinaldo and Tony Rinaldo were 2 of my cousins if any of you guys knew them. Speedy's was the hangout for Butchie, so I've been told. you missed the best thing.in the summer time the biggest baddest strawberry pie you could fined anywere.Yummmmmmm. The houses on the hill in the background look like 16 and 18 Chilmark Street. They are still there. Does anyone have the recipe for the grass on the top of the burger. It was chopped lettace in a creamy sauce. Would love to duplicate it at home. There use to be a drive in burger place on Mill Street along Coes Pond.. That street was called the Speedway then years ago. I think they had curb service to your car. neet place.. Was that a Speedy Burger...it was af the foot of the road to Worcester Airport. Skip Roy is my cousin. He bought Thur Chevy when he got out of the navy. He told me he couldn't keep it running at legal street speeds because of the full race cam. After he drove it for awhile he took the 409 out of it and put in a 283 so he could drive that sweet thing. He built a dragster using the 409. I didn't have much of a chance to pal around with him in the early 60's because my time was being consumed by Whoopie Tech. Sure miss those days though. Skip became one of Worcester' finest until he was shot by some scum bag. He's still living in Worcester. I'm in a little ranching area in Virginia near the Blue Ridge Mountains. Great to catch up on stuff about central Mass.